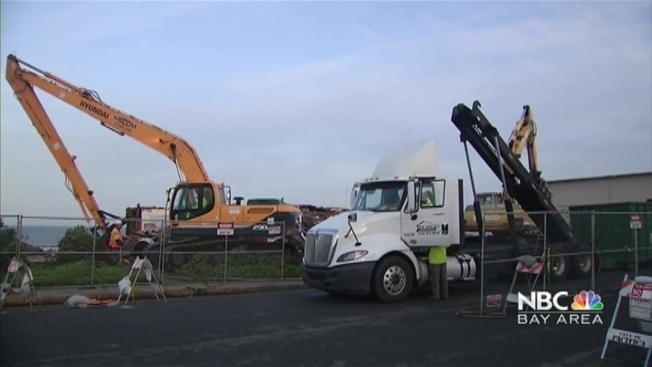 The 20-unit apartment complex that used to stand at 320 Esplanade Avenue in Pacifica, on the ledge of a cliff overlooking the Pacific Ocean, was no more on Monday after a demolition crew started taking down the structure over the weekend. The city-contracted workers hope to have this plot of land leveled and clear by Wednesday, depending on the weather conditions. Pacifica officials red-tagged and evacuated the apartment complex in 2010, as the cliff began to erode and part of the apartment complex teetered on the edge. The property in question was supposed to come down much sooner but its owner, Millard Tong, declared bankruptcy. "He’s had an opportunity to shore up the cliff, like his neighbors have done, or to demolish the building," Pacifica city Manager Lorie Tinfow said. "He’s done neither, so the city started taking action last summer to hold him accountable." The city is fronting the $200,000 demolition costs which it hopes to recoup on behalf of taxpayers. The demolition crew will leave the concrete foundation in place to help stabilize the cliff, until the city can find a permanent solution. "We’re in talks with the Army Corps of Engineers about the possibility of shoring up the cliff edge, our concern after these buildings are down is that the street could be the next at risk asset and of course that’s our asset and we want to protect so we’re actively in talks with the Army Corps about help," Tinfow said. The demolition crew will also use a large crane to retrieve some debris that fell onto the beach below. Last month, the apartment complex next door at 330 Esplanade was demolished and the land leveled and cleared. The city has also yellow-tagged the apartment complex at 310 Esplanade, which also happens to be owned by Tong. Some residents of 310 Esplanade will appeal that yellow-tag ruling at hearing scheduled for next week.